Games, crafts, activities, workshops, plus so much more to make the dark a little less scary and a lot more fun for children. 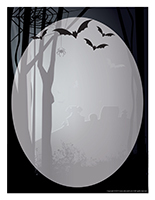 Activity sheets, posters, word flashcards, puppets, stencils, and tons of other printable documents for exploring the dark with your group. 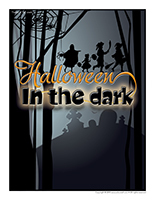 (Open thematic poster-Halloween-In the dark) Print, laminate, and display all kinds of posters. 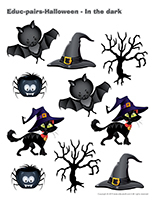 (Open educa-decorate-Halloween-In the dark) Print, laminate, and cut out the various items. Use them to decorate your daycare and set the mood for the theme. (Open garland-Halloween-In the dark) Print and let children decorate the garland. Cut it out and hang it within your daycare or in your daycare entrance. Set a large black tablecloth on your table and encourage children to stick glow-in-the-dark stickers on it. At snack time, turn the lights off and admire the different items. This special tool was created in response to a special request received. 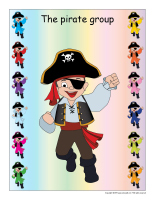 (Open group identification-Pirates) Print, laminate, and display in a specific area of your daycare and use the items to identify children's belongings. 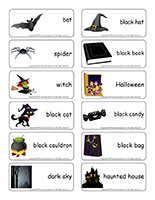 (Open educ-chat-Halloween) Educ-chat is a game which is made up of several different illustrations which represent subjects, verbs, and objects. They can be used to help children make complete sentences and enrich their vocabulary. Print, cut out, and laminate the cards. Make three different piles (subjects, verbs, and objects). Ask children to pick three cards, one from each pile. Have them "read" the sentence. The sentences will sometimes be quite silly, but you are sure to have fun. You may also choose to place the cards yourself and have children "read" the sentences. Purchase several colourful glow stick bracelets. Turn the lights off to greet children in the morning. As they arrive, hand them a bracelet they can wear. Set up a projector to project pictures and illustrations on a wall. If possible, use an old slide projector to project a white circle on a wall and encourage children to stand in front of it to admire their shadow. 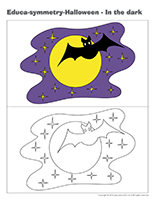 (Open activity sheets-Halloween-In the dark) Print and follow instructions. 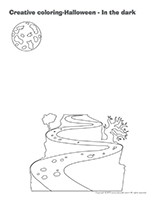 (Open writing activities-D like dark) Print for each child or laminate for use with a dry-erase marker. (Open stationery-Halloween-In the dark) Print. Use the stationery to communicate with parents, in your writing corner, or to identify your thematic bins. (Open scene-In the dark) Print, laminate, and cut out. Children can use the items to create a variety of scenes and stories. During this theme, encourage children to explore workshops in the dark, using a flashlight. If possible, set up a black light too. Use blocks to build haunted houses. Miniature decorations which can be used to decorate doll houses, your toy garage, or haunted houses built with blocks. Plastic insects (especially spiders)...you will need many, they will be popular! Hang a spider web in one corner to set the mood. Deposit a hay bale in one corner. Children will love building on it! (Beware of allergies!). Use fabric on the floor or on the walls to change the setting. Paper and cardboard in every shade of Halloween: orange, black, purple, and green. 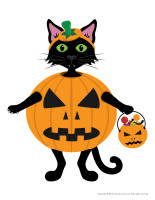 Models of cats, bats, pumpkins, witches, hats, candy...they can be cut out and used to make collages, painted, coloured, or children can add crumpled pieces of tissue paper to them. Make a piñata shaped like a pumpkin and fill it with Halloween treats. Recycled materials can be used to make a model ghost town. Monster, robot, or other types of masks. Children will enjoy parading around the daycare or outside. Hats of all kinds made from cardboard and decorations. Collages and crafts using candy! Children will surely eat some along the way, beware of allergies! Confetti, foam shapes, Halloween-coloured sparkles, feathers, shiny glue, etc. They can all be used to decorate individual miniature pumpkins or one large pumpkin as part of a collective project. 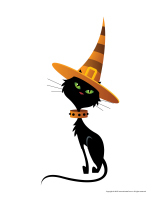 Drawings and pictures related to the theme: cats, witches, pumpkins, costumes, etc. Drawing with waxed crayons or candles. Makeup, either you paint their faces or you let children paint their friends' face or even their own if you provide mirrors. Kitchen items such as glasses, utensils, Halloween bowls. Children will pretend to cook in a haunted kitchen. 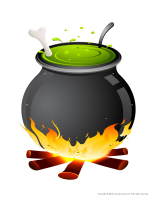 A witch's cauldron and cooking utensils such as large spoons. Children can stir their concoction (dried orange, black, or white lentils are perfect!). Add a few plastic spiders just for fun! Using old spice bottles, children can pretend to create witch spices using Halloween items such as miniature pumpkins, insects, or ghosts. Remember to seal the containers with hot glue. 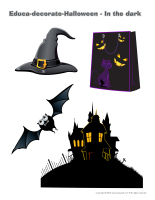 Have parents bring various clothing items to daycare to add to your costume box. A puppet theatre and puppets that represent Halloween characters. Old white sheets (or tulle which is better since it makes it possible for children see where they are going) to transform children into little ghosts. Capes (old sheets) on which children may draw to transform them into vampire, magician or superhero capes. Various accessories such as plastic or rubber fingers, oversized glasses and a plastic nose, wigs, etc. 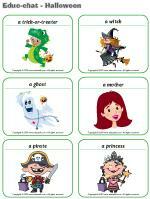 Halloween memory game using educatall pictures. Orange or black modeling dough and Halloween-shaped cookie cutters. Lotto game or other board games adapted to the ages of the children in your group. Halloween-coloured fabric with various textures. Pumpkin seeds can be used for counting and sorting into containers numbered 1 to 10. Sequential stories related to Halloween. A song box with a variety of Halloween songs. Associate pictograms to the songs and display them on the wall, children will love to sing them over and over again! Have parents provide pictures of children with their Halloween costumes from previous years. Use the pictures to create an album children can admire. A Halloween sound CD children can enjoy with headphones. Game with educatall word flashcards. Tracing Halloween words will help visualize letters. Connect the dot activities with witches, pumpkins, brooms, etc. Educatall hunt and seek game. Find the differences between two Halloween pictures. An obstacle course where children must collect pumpkins along the way. A treasure hunt where children search for objects that are white like ghosts, orange like pumpkins, or black like cats...this activity can be done indoors or outdoors, using pictures or real objects. Toilet paper can be used to wrap children like mummies. A Halloween version of "Simon says", for example "Mr. Pumpkin says" or "Mrs. Witch says". A chasing game where the witch attempts to catch her cat or ghost friends. Obstacle course related to Halloween safety. Water table with orange food coloring. Bins filled with orange or black noodles, sand, or rice. Witch bin (see role play). Insect bin (miniature plastic insects found at dollar stores). Bin filled with cooked noodles and a small quantity of dishwashing liquid. Bin filled with orange or dark purple Jell-O, it will have a special texture if lightly stirred. The melting candle, manipulated by an adult. Children will observe and be fascinated! Orange and black balloons can be used to test static electricity. (Open game-This is my spot-Halloween-In the dark) Print two copies of each illustration. Use adhesive paper to stick one copy of each illustration on the table. Place the second copy in a bag. Children take turns picking an illustration to determine where they must sit at the table. You may also use the illustrations to determine children's naptime spots or their place in the task train. Stick fluorescent stickers on black paper. Use adhesive paper to arrange these items on the floor to create a path. The path can lead to the bathroom, the cloakroom, etc. If you prefer, use the illustrations to delimit various areas. 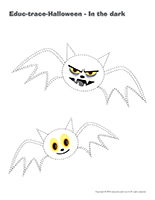 (Open lacing-Halloween-In the dark) Print, trace the shapes on heavy cardboard, and cut them out. Punch holes all the way around each model using a hole-punch. Children will enjoy lacing the shapes with a shoelace or a piece of string. Have children stand around your parachute, each holding a handle. Once everyone is in position, turn the lights off to make your daycare as dark as possible. Deposit several glow stick bracelets on the parachute. When you give the signal, children must raise the parachute high in the air. As the glow stick bracelets fall to the ground, encourage children to collect as many as they can. Count how many bracelets each child caught. Repeat as long as children are having fun. This is actually another version of the cat and mouse game with your parachute, modified so it can be played in the dark. Children hold the edge of your parachute and gently move it up and down to create waves. Select a child who will be the cat. He/she must crawl around, on top of the parachute. Select a second child who will be the mouse. He/she must move around under the parachute, carrying a flashlight or wearing several glow stick bracelets on his/her arm. The cat must follow the light to catch the mouse. Try to create as much darkness as possible within your daycare. Set a flashlight (light source) in one corner of your daycare. The leader of the game must stand facing the light source and count while the other children stand on a line, just a few metres away. When the leader is done counting, he/she shouts "moon" and turns around very quickly. The other children must remain perfectly still. If a child moves, he/she becomes the leader of the game for the next round. Give each child a small flashlight. Turn off the lights and close the curtains to make your daycare as dark as possible. Children walk around the daycare, using their flashlight to observe different items. Blindfold a child and hand him/her a piece of chalk. Encourage the blindfolded child to draw something on the ground (asphalt or cement). If you wish, you can ask the child to draw something specific, a sun for example. You may also let him/her draw whatever he/she wants and encourage the other children to try to identify the item. Children take turns pretending to be a captured monster. Blindfold the child who is the monster. He/she will have to obey your commands (and those of the other children too). Have fun making each little monster complete an obstacle course (with no actual obstacles). You can, for example, have them bend down, crawl through a pretend tunnel, or slither under a bench that doesn't really exist. The other children will have a lot of fun watching their friend complete the imaginary obstacle course. Variation: Of course, this activity may also be done using an obstacle course that involves real obstacles. The blindfolded child can be required to walk around cones, go through a tunnel, walk under a bell without making it ring, etc. Set up your bowling game in one corner of your yard (or within your daycare). Children take turns rolling a ball towards the bowling pins while blindfolded. Adapt the space and game according to the ages of the children in your group. You can, for example, use a very large ball with young children to increase their chances of successfully making the bowling pins fall down. You will need a basket and several balls of crumpled paper. Blindfold one child at a time. Have them try to toss five balls of paper in the basket. They may not succeed, but they will have a lot of fun trying and, even more, watching their friends try. Have one child hide within your daycare with a small drum. When you give the signal, the other children search for him/her. The child who is hiding can tap on the drum from time to time. The other children must pay attention to this musical clue to find the child. Replace your usual lights with black lights. Invite children to wear dark clothing items and give each child a white scarf. Children will enjoy moving their scarf up and down as they dance. The black lights will create a special effect. Note that old t-shirts and pieces of toilet paper work just fine too. Stick glow-in-the-dark stars (or other fun shapes) on your daycare ceiling. Encourage children to look up at the stars to help them relax and fall asleep at naptime. Ask around to see if someone you know has a "constellation" nightlight. If you find one, set it on a table, in the centre of your daycare. It will project hundreds of colourful stars on your daycare ceiling. You may use it for several days so that children get to admire the many different colors. 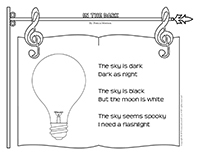 Throughout this theme, have children use flashlights to complete a variety of activity sheets in the dark. (Open educa-symmetry-Halloween-In the dark) Print. Children must color the picture on the bottom to make it look exactly like the picture at the top of the page. 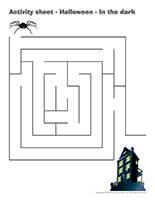 (Open educ-trace-Halloween-In the dark) Print for each child. Children must trace the dotted lines using a crayon of the corresponding color and then color each object using the same color. 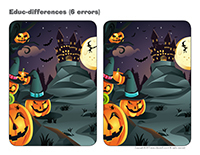 (Open educ-differences-Halloween-In the dark) Print and laminate for durable, eco-friendly use. Children must find the differences between the two pictures and identify them using a dry-erase marker. (Open educ-pairs-Halloween-In the dark) Print. Children must color identical items using the same color or draw a line between them. For durable, eco-friendly use, laminate for use with a dry-erase marker. 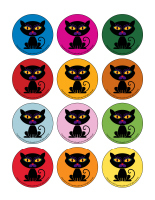 (Open educ-shadows-Halloween-In the dark) Print and laminate for durable, eco-friendly use. Children must draw a line between each item on the left and the corresponding shadow on the right using a dry-erase marker. 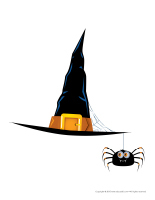 You will find several other Halloween-themed activity sheets in the educatall club. (Open sometimes, I am scared of the dark) Print for each child. Discuss being afraid of the dark with your group. Encourage children to draw what scares them most about the dark. Sit with your group in your daycare or a room where you can shut the curtains to make it relatively dark. Turn the lights off and ask children to tell you what they see. Wait a few minutes, and repeat your question. Explain how our eyes get used to the darkness so, after a few minutes, we can see things we couldn't see at first. Replace your main light source with a black light. 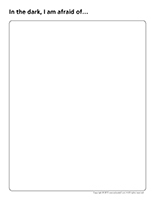 Be sure each child is wearing a white clothing item. When you turn the black light on, the white clothing items will pop. Help children realize how the other colors cannot be perceived. Prepare a meal that children are familiar with and appreciate. Serve it in the dark. Depending on the ages of the children in your group and their reaction, you may choose to dim the lights instead of turning them off completely. You can also blindfold older children. Children love candlelit meals. Purchase battery-operated candles since they can safely be used with young children. Set them on your table and enjoy a relaxing meal with your group. Purchase black disposable plates and utensils as well as a black paper tablecloth and black paper napkins for a special Halloween lunch. Deposit small white ghosts here and there. The contrast of the two colors will add an interesting decorative touch. (Open models-Halloween-In the dark) Print as many copies as you need. Use the models for various collages, cutting activities, and projects throughout the theme. (Open puppets-Halloween-In the dark) Print the puppet models on heavy cardboard. Invite children to cut them out and decorate them with various materials. Attach a Popsicle stick to the back of each model to create a puppet. 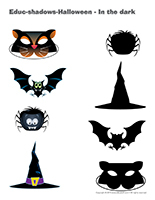 (Open stencils-Halloween-In the dark) Print and cut out the various shapes. Children can use them to trace or paint a variety of items related to the theme. Select a Halloween-themed craft or project. Instead of using your main light source, set several battery-operated candles on the table. Invite children to use gel crayons (pens) to draw on dark construction paper. They will like how the lines they draw will shine, just like magic. Encourage children to use white chalk to draw on black construction paper. Purchase fluorescent paint at your local hardware store and use it to create posters. Invite children to use the fluorescent paint to create a mural. Depending on the ages of the children in your group, you can even ask children to paint their mural in the dark. Have each child paint a Styrofoam ball with black paint and insert black pipe cleaners to represent legs. Help them glue wiggly eyes on their spider (or let them paint the eyes using white paint). (Open models-spiders) Trace the spider model on black paper and have children cut it out. Let them decorate their spider as they wish. When they are done, show them how they can wrap their spider's legs around a pencil to "curl" them. 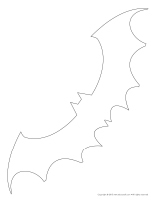 (Open craft-bats) Print and trace on heavy cardboard to create a model. Encourage children to trace the model on black construction paper. Have them cut the wings and glue them on an empty toilet paper roll wrapped with black construction paper. Attach a long piece of black yarn or ribbon to each child's bat and hang them from a clothesline hung within your daycare. Remember, bats sleep upside down during the day! 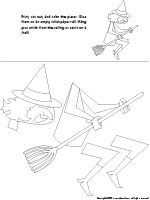 (Open my little witch) Print, cut out, and color the pieces. Glue them on an empty toilet paper roll. Hang each child's witch from the ceiling or set them on a shelf. 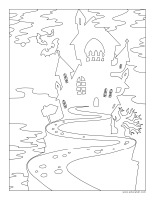 (Open creative coloring-Halloween-In the dark) Print for each child. Ask children to complete the drawing. (Open I am learning to draw-A bat) Print and laminate the model sheet. Encourage children to practice their drawing technique on the model sheet. When they are ready, they can try to draw a bat on their own. 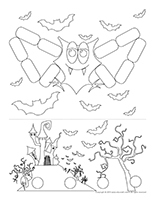 (Open coloring pages theme-Halloween-In the dark) Print for each child.